A Fun Downloadable Sudoku Puzzle Game! Sudoku is a simple, addictive puzzle game that has taken the world by storm! Use reasoning and patience to solve the number grid, without the need for luck or guesswork. Whether you call it Sudoku, Su Doku, or simply Number Place, the rules of this mind-boggling puzzle game are simple: Fill in the grid so that every row, column and 3x3 box contains each of the digits 1-9 only once. Sound simple enough? Studies have also shown that playing puzzle games such as Sudoku on a regular basis can improve your memory, relax and clear your mind, and even prevent certain brain illnesses! 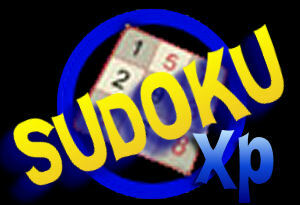 Download Sudoku XP and we guarantee it will have you hooked in no time! The basic idea of Sudoku is to fill in all of the blank cells on the game board so that every row, column, and 3x3 box contains the digits from 1 to 9 only once. Sudoku games can be solved using logic, meaning that you should never have to make guesses if you use the right strategy. For some good introductory information about the history of Sudoku games and some effective game playing strategies, take a look at Wikipedia's Sudoku page. If you would like to play Sudoku XP without having to download the software, please try our free online Sudoku that can be played inside of your web browser using Java technology. A small window will appear on the screen asking if you want to "Run" or "Save" the Sudoku setup file. Select the "Run" option. Once the Sudoku progam is downloaded, the setup program will begin. Simply follow the on-screen instructions to complete the installation. After the game is installed, you can start the puzzle game by clicking on the Sudoku XP icon on your Windows desktop. The Sudoku XP game screen is divided into three sections. The left edge of the screen consists of buttons numbered 1 to 9, along with an "erase" button at the bottom-left of the screen. These buttons allow you to select the "active digit" that you want to place onto the game board. The middle of the screen is where the Sudoku game board is located. When you start a game, some cells will already have gray-colored numbers in them. These numbers are the fixed cells that you cannot change. The remaining blank cells are where you will be able to place your desired numbers. The right side of the screen contains your current play time and difficulty setting. There are also some buttons for pausing the game, resetting the puzzle game board, activating the help screen, and popping up the game options menu.